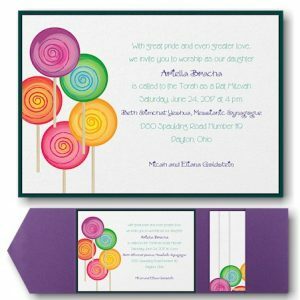 This gorgeous Bat Mitzvah invitation is raised printed on five layers of card stock. From top to bottom: Aqua Mist Shimmer, Silver Mirricard, Marine Dazzle, Silver Mirricard and Lagoon Shimmer. This gorgeous Bat Mitzvah invitation is raised printed on five layers of card stock. From top to bottom: Aqua Mist Shimmer, Silver Mirricard, Marine Dazzle, Silver Mirricard and Lagoon Shimmer. (Due to the scanning process, the Silver Mirricard appears Black, but is really a reflective Silver.) Measures 8-3/4″ wide by 6″ high. 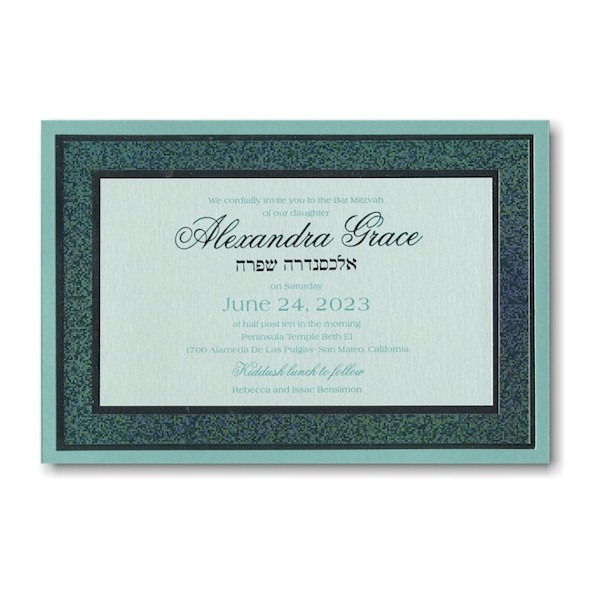 Shown with Metallic Teal foil stamping and Aqua ink and lettering styles Americana/Flemish. The coordinating enclosures will be double layered and the Thank You notes will print on folder stock. 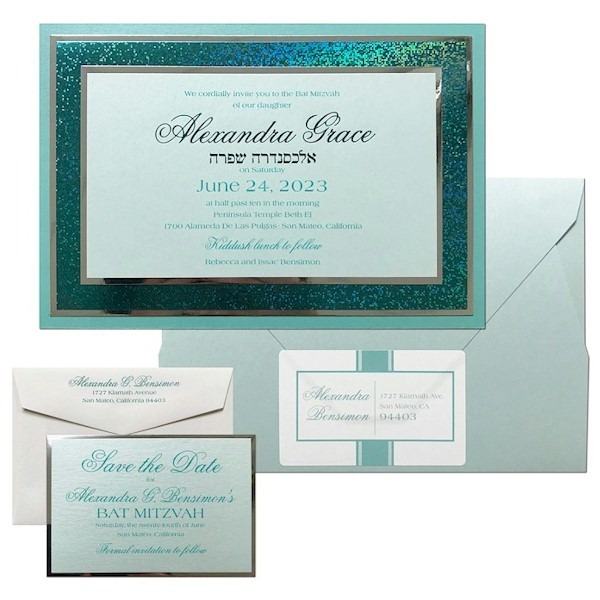 The Bat Mitzvah invitation comes with double bright white envelopes. 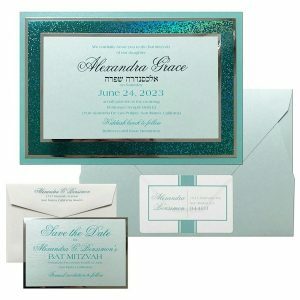 Note: The price of this invitation includes a printed outer envelope and a plain inner envelope in bright white. 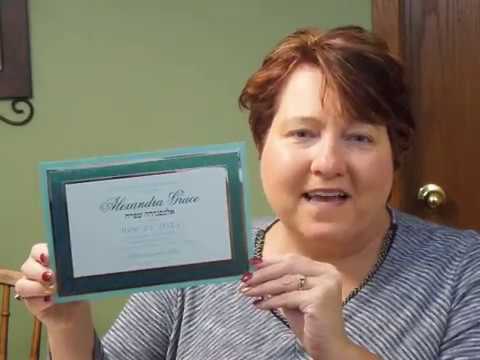 The large image displays an optional upgraded Aqua Mist Heavyweight envelope with a matching label. 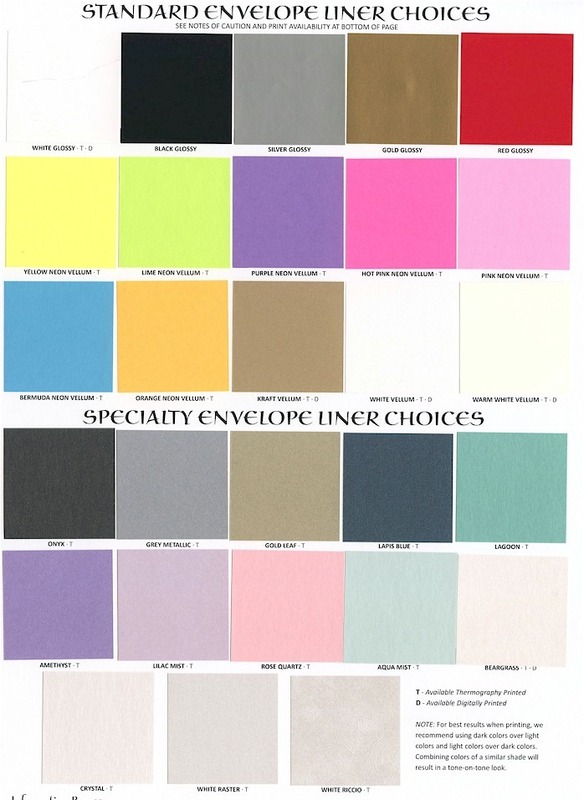 If the Heavyweight envelope is desired, please make your selection under the "Optional Heavyweight Envelopes" section. Heavyweight envelopes are die-cut and scored and require folding by customer.